Vistaprint – is a Cimpress company, which provides a broad range of web building and business marketing services. Its major focus is not made on website development only as the company centers around helping small businesses and entrepreneurs find and implement their great ideas for effective promotion. Founded in 1995, Vistaprint helps develop up-to-date, logically-structured and professionally designed custom marketing solutions, providing the assortment of niche-specific products like printed media, integrated hosting and eCommerce, domain selection, website design and other customizable small business marketing solutions. There is no sense to talk about Vistaprint as about an individual website builder, because the company doesn’t actually have the one. Instead, it partners with Webs, offering almost the same features and options as this platform. In other words, Vistaprint can be called a disguised version of Webs, which somewhat differs in pricing policy and offers more extensive web design and promotion services. If you are still interested to find out the major Vistaprint features, you can read the review of the system specifying its major details and things to consider. This will be helpful to users, willing to find out the advantages of Webs or those of Vistaprint prior to making the final solution. Are you ready? Let’s get started now! Just like Webs, Vistaprint is not quite easy to use. This is mainly explained by the specialization of the system and the range of tasks it covers. The dashboard of the system looks somewhat outdated, while its interface is not quite logically-structured to be understandable to everyone. Whether you are a newbie or a professional website developer, you will hardly be able to call Vistaprint easy-to-use or intuitive. The system is divided into the Dashboard and the Builder itself that makes it possible to adjust the major website settings and control the steps you make when working on your website design. The Dashboard contains such tabs as Premium, Statistics, Domains and Email, Form Submissions, Mobile, SEO Booster, Settings and Matching Products. Another handy tool is Local Listings, which helps you create, update and distribute your business info across more than 100 local search directories in the search engines. The Builder is module-based, offering multiple sections, categories and tabs that provide access to the features and elements you can add to the website here. One of the advantages of the platform is that Vistaprint comes with the WYSIWYG website editor, where all the changes and edits you make at the page are directly displayed on the screen. What you have to do is to select the required elements from the tabs found in the low part of the builder, drag them onto a page and adjust their positions. You can replace the elements and modify their positions as you wish based on your website layout. The sign up process is quick and easy here as well. Just fill out the fields to specify your personal and business data and proceed to the template choice, which is quite extensive here, by the way. That’s it. The system doesn’t imply the knowledge of coding skills, even though, its interface design and dashboard require more contemporary and sophisticated look. As soon as you get access to the homepage of the service, you’ll come across the list of products it offers both online and offline. The latter include all types of printed media (brochures, business cards, posters, banners, outdoor signs etc. ), marketing materials, logo and brand development, signage and trade show displays, photo gifts, invitations and stationery, clothing, bags, promo items and design services. There is also Websites and Digital Marketing section here, where you can get access to the Website Builder to start designing your own web-based project. Reviewed below are the major features of the system that require your awareness of them. The service makes it possible to add a web store to the website. Its integrated eCommerce engine is not that powerful, but you can set up and manage a decent online store with it in almost no time. 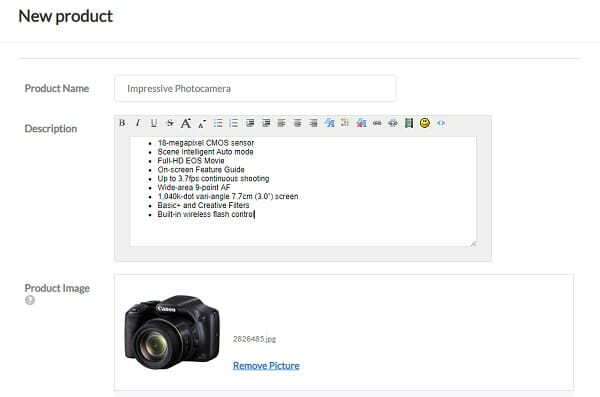 What you can do here is to create, add and edit product lists, photos, descriptions, parameters, statuses etc. It is also possible to assign categories to various products depending upon their implication and your eCommerce objectives. The system accepts PayPal payments for selling multiple shopping cart items and makes it possible to adjust shipping options. When setting up a DIY web store, you can integrate your Vistaprint store with Etsy account (if you have the one) to get access to advanced features of the platform and more extensive payment options. Finally, you should remember that Vistaprint doesn’t charge transaction fees from the sales made within the service. The website builder lets you choose among lots of stock images that belong to various topics. Just select the photos that come up to your particular web design needs and insert them into the web page. By using social media marketing options, the system lets you promote your newly-built website with ease. This is the surefire way to attract the attention of the target audience, keeping them aware of your business events, news and updates. You can choose the existing Vistaprint promotional materials you’ve created before to further integrate them into the website. The system can coordinate the project with images or logos you’ve built with Vistaprint. This contributes to better business recognition and helps build customer trust and brand popularity. Vistaprint offers several subscriptions that come with custom URLs to simplify users’ search and contribute to better promotion of your website in the search engines. What’s more, the service offers individual SEO tools to make sure the customers will be able to find you on the top positions when browsing through popular search engines. You can track your website statistics to make the profound website analysis and adopt smart marketing solutions. Among the factors you can control and analyse, it makes sense to track website traffic, locations visitors come from, conversion rates, website visits during a certain time interval etc. Vistaprint developers realize well that imagery can make or break website quality. Thus, they offer a rich collection of high quality icons, videos and images available in stock. With Vistaprint, you can successfully launch, manage and update a blog, making use of its functionality. This is done with a few clicks only, enabling you to add, edit and schedule blog posts. If you wish to boost your business popularity and build customer base, you can submit your company information to multiple local listings directories. This ensures quick growth of product popularity, conversion rates, traffic engagement and the increased demand for your services in the search engines. Generally, the service makes it possible to enlist your company with more than 100 online local directories – this is just a matter of minutes! Based upon your business niche, Vistaprint will offer the range of custom printed marketing materials they specialise in. Due to this feature, your website visitors will be able to offer printed business cards, clothing, postcards, banners, logos and other items that will additionally contribute to business popularity. If you wish to keep your customers aware of the business events, news or updates, you can send newsletters to them on a regular basis. Premium plan users can apply their HTML coding skills for advanced text and image formatting options. Currently, Vistaprint offers around 1000 templates to match your business cards and industry requirements. The templates are mobile responsive and subdivided into several sections you can choose from. There are no many of them here, namely All Templates, New Designs, Generic and Blank Design. The latter option lets you pick a blank theme and edit it from scratch with regard to the requirements and available information. Whatever template you will go for, you’ll be able to quickly customize it with a few clicks. To do this, you can upload and use free stock images or those of your own, insert and edit your business logo, select the color scheme to match your brand palette, edit fonts and texts, add, remove and arrange content, set up website body, navigation bar and footer etc. If you are not satisfied with the selected template for some reason, you can always switch between them until you find the most suitable variant. What you should bear in mind is that each template is comprised of content blocks, modification and proper arrangement of which results in the creation of a decent website. This is the feature that makes the website builder intuitive in nature, letting even first-time users create and manage websites on the go. The blocks are fully-customizable as well and you can fill them with your own content with a few clicks. 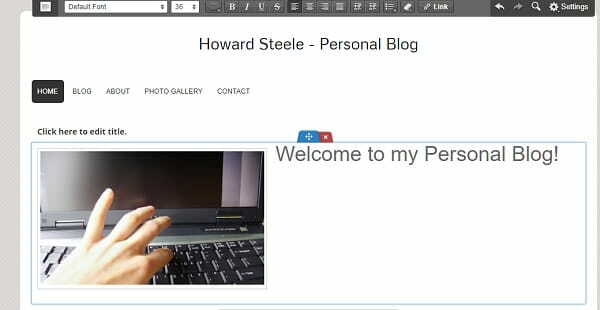 The mobile editor the system comes with makes it possible to set up the mobile version of your project on time. Mind that Vistaprint doesn’t offer any CSS/HTML code editing options. This makes it impossible to create unique website design, but this does not matter a lot for non-techies. At the same time, the platform allows creating your own video channel and integrating YouTube niche-related videos into your project. Vistaprint customer support is on a decent level. Whatever questions or problems you encounter when working with the service – you’ll find decent answers and several support options here as well. Thus, the platform offers its subscribers an opportunity to connect with them in the social networks to share their ideas and experience. Email and phone assistance are available in the service, making it possible for users to get qualified help in around 24 hours since the inquiry moment. If you still don’t manage to find the required information from these sources, Vistaprint offers 24/7 Chat Now window, the specialists of which are ready to help you with any website-related questions or problems you currently have. Right after you register with the system, you’ll see a comprehensive video guide on how to get started with the service to create a decent website. Apart from the above-mentioned options, the website builder offers self-service tools, community forum and extensive Knowledge Base with useful tutorials, articles and guidelines on how to use the system to the advantage. 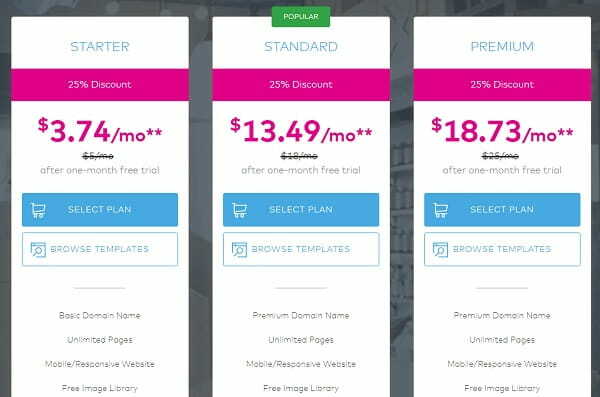 Even though, the plans differ with regard to the services and tools offered, each of them still comes with unlimited number of pages you can create for your website, free hosting and phone support. The more expensive plan you choose – the more advanced options you’ll get to design a website. Vistaprint – is a system, which encompasses a range of online and offline services at a time. The company is focused on the needs of small businesses and entrepreneurs, offering a wide spectrum of design, marketing and promotion services. It is initially geared towards the intentions and requirements of non-techies, but it can also be used by experienced website developers. 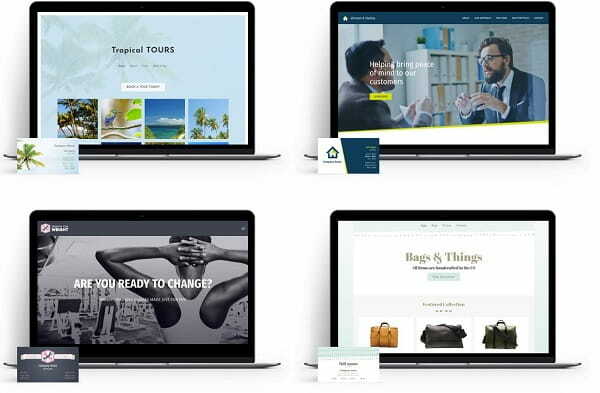 Vistaprint also offers the services of the website builder, which is, however, similar to Webs – the official partner of the company. The range of features and services Vistaprint provides is the same offered by Webs. The only difference between the systems is the pricing policy. Being a more full-featured service, which is not focused on website development only, Vistaprint offers more expensive rates, which also differ in the amount of services provided. Is Vistaprint worth testing? If you’ve already worked with Webs and do not require additional marketing and business promotion needs, then you can easily go without it. Even if you’ve not managed to test Webs yet need a decent website, then Vistaprint is not the best solution. It’s just not worth your time, effort and budget. Why risking and choosing uncertain future for your website, when there are so many established, tried-and-tested website builders out there?